Want to play a MOG (multiplayer online game) passively while surfing the web all day? Then you’ll like PMOG, the first game developed by California and UK-based GameLayers. PMOG, which is currently in private beta with 150 or so users, is a Firefox add-on that lets you interact with other users asynchronously on websites you visit. In some ways it is like Stumbleupon – users can create “missions” which are groups of websites under a theme (one is called “Laugh, Hard” and is a group of humor sites; another is called “Tech News Tour” and includes links to Engadget, Gizmodo, Digg and Slashdot). When you go on a mission a controller appears in the bottom right of your screen, letting you move from site to site. Users can also be more mischievous, leaving mines on websites that other users stumble onto and cause them to explode. Points are deducted unless you’re wearing armor. 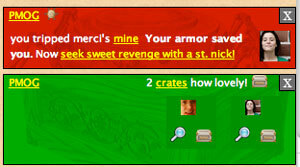 Other users can also attach “St Nicks” to users who leave a lot of mines, which causes their next mine not to work. Finally, a user can add a “portal” to any page, which is a link to a new website. Click it if you want, although there very well may be a mine waiting for you at the other end. All in all it’s a lot of fun. While on the phone with CEO Justin Hall, I asked him to go to Google, where I had a mine waiting for him. He tripped it, causing damage to his armor. I thought it was hilarious. 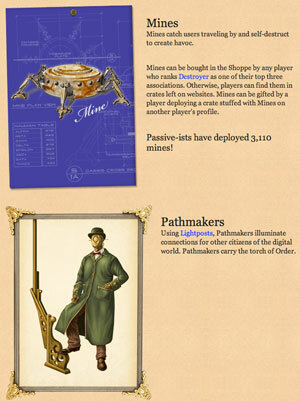 You have to rack up points to buy mines and all the other stuff that makes the site fun. Every unique domain that you visit gives you two points, so you get points just from surfing the web. You can also give gifts of mines and other tools to others by leaving “crates” around. Justin’s fiance, Merci Hammon (the company’s CCO), gave me a gift of ten mines while I was testing the service, all of which I am aiming at Justin. Gathering points and completing missions leads you to higher levels, where you eventually choose a character type. There are six characters in all – two are “chaotic” and leave a lot of mines and portals. The rest follow the “torch of order” and focus on protecting others or creating useful missions. All those user created missions create page views for the sites covered, so it gives an incentive for people to add them. And here is one possible business model for the game – having advertisers create sponsored missions that give users some reward for completing them. A badge, for example, or points. Hall says they’ll look at other ways to eventually make money once the community is more mature and they see how people use the service. The game is easy to play because you gain points in the background while surfing the web, and interact with others only when you want to (or when you stumble on a mine). What makes it compelling is the inspired design and storylines that they’ve created as well. When and if you join the service, watch out. I’ve left mines all over TechCrunch to trip you up. Gamelayers raised a small round of funding – $500k – in September 2007 from OATV, Joichi Ito and Richard Wolpert. For now the site is in private beta. Sign up for an invitation on the home page. Update: Get an invitation to PMOG here.